Jack Crabtree - Welsh miner - Online gallery supplying original fine art. Trending Modern British and Contemporary Welsh. Available for sale from Big Sky Fine Art; this original painting by Jack Crabtree; dating from the 1970’s.<br> The painting is presented and supplied in a sympathetic contemporary frame, mounted using conservation materials and behind non-reflective museum glass.<br> The painting is signed lower right.<br> <br> Jack Crabtree has had a significant and successful career as both a contemporary figurative artist and a teacher. He was born in England but is very much thought of as Welsh. He is best known for his social realist work of the 1970s and in particular for his paintings of miners. <br> <br> Jack Crabtree was born in Rochdale, Lancashire in 1938 and studied locally <br> at Rochdale College of Art from 1955-57. He then attended the St. Martin’s School of Art, graduating in 1959, and then the Royal Academy Schools 1959-61. After leaving the Royal Academy he began an impressive career as a teacher; he first lived in the northwest, where he worked as a lecturer in art at Salford and Rochdale Colleges of Art, and then he moved to Wales, being appointed a tutor at the Newport College of Art. He went on the become Professor and Head of Fine Art at the University of Ulster from 1983-86. The following year he moved to France and settled there until the 1990s, when he returned to north Wales. <br> <br> He has been awarded several honours for his art, including the Gregynog Arts Fellowship from the University of Wales and has been given Fellowship of the National Coal Board. <br> <br> His style has been described as social realism, neither didactic nor over-emphatic and his vision as affectionate rather than romantic. He specialises in paintings of miners and it is for this that he is perhaps best known. Margaret Richards wrote; “He sees wild hillsides as a beautiful setting for one of the grimmest jobs facing any man. In his paintings, that beauty and that grimness are parts of an inter-locking reality that has stimulated his creative imagination…”<br> <br> Prominent commissions have led to some of his very best work; in 1974-75, he was commissioned by the National Coal Board to present an artistic record of life and work of the miners and their community in South Wales. Crabtree spent over a year living among the miners and produced over 100 paintings, capturing the grit and beauty of the men, their working conditions and their families. The resulting work reflected a stark reality, but also his own compassion and rapport with the people. (For years he believed that many of the paintings had been lost, until a BBC project reunited him with most of them in 2013. It was a touching and emotional tribute to the man and the artist.) The south Wales mining project was such a success that in 1977, he was awarded a Fellowship by the German Federal Government to do a similar internship among the miners of the industrial Ruhr Valley. Another industrial commission came in 1991, when the National Trust invited him to be artist in residence at Spade's Mill, Northern Ireland. <br> <br> Jack Crabtree had his first solo exhibition in 1975 and since then he has had over 70 others, including at the Howard Roberts Gallery, Cardiff, the Rubicon Gallery, The Ulster Museum and the Kerline Gallery, Dublin. He has contributed to many significant group exhibitions with the Welsh Arts Council, the Trafford Gallery, the Arts Council of Great Britain and the Newport Museum and Art Gallery.<br> <br> Today Jack Crabtree has a secure reputation as one of the finest Welsh artists of the twentieth century. His works can be found in many private and public collections, including those of the Ulster Museum in Belfast, the Arts Council in Northern Ireland and the Arts Council in Ireland, Aberystwyth University, the National Museum of Wales, the Contemporary Art Society for Wales, the NCB, the National Library of Wales, the University of South Wales the National Trust and others.<br> <br> Jack Crabtree lives in Penygroes, North Wales.<br> <br> This original work is a close-up portrait of a Welsh miner. He is in working clothing, with a miner’s lamp on the top of his helmet. The piece seems to be created out of the very stuff that he mines – coal. His face and clothes are ingrained with the coal dust and his face speaks volumes about the harshness of the work he does and the bravery he demonstrates every working day. This piece is not sentimental, but real and gritty; his eyes shine out from his rugged features and you know that this is a man who says little, but moves mountains! Available for sale from Big Sky Fine Art; this original painting by Jack Crabtree; dating from the 1970’s. The painting is presented and supplied in a sympathetic contemporary frame, mounted using conservation materials and behind non-reflective museum glass. Jack Crabtree has had a significant and successful career as both a contemporary figurative artist and a teacher. He was born in England but is very much thought of as Welsh. He is best known for his social realist work of the 1970s and in particular for his paintings of miners. at Rochdale College of Art from 1955-57. He then attended the St. Martin’s School of Art, graduating in 1959, and then the Royal Academy Schools 1959-61. After leaving the Royal Academy he began an impressive career as a teacher; he first lived in the northwest, where he worked as a lecturer in art at Salford and Rochdale Colleges of Art, and then he moved to Wales, being appointed a tutor at the Newport College of Art. He went on the become Professor and Head of Fine Art at the University of Ulster from 1983-86. The following year he moved to France and settled there until the 1990s, when he returned to north Wales. He has been awarded several honours for his art, including the Gregynog Arts Fellowship from the University of Wales and has been given Fellowship of the National Coal Board. Prominent commissions have led to some of his very best work; in 1974-75, he was commissioned by the National Coal Board to present an artistic record of life and work of the miners and their community in South Wales. Crabtree spent over a year living among the miners and produced over 100 paintings, capturing the grit and beauty of the men, their working conditions and their families. The resulting work reflected a stark reality, but also his own compassion and rapport with the people. (For years he believed that many of the paintings had been lost, until a BBC project reunited him with most of them in 2013. It was a touching and emotional tribute to the man and the artist.) The south Wales mining project was such a success that in 1977, he was awarded a Fellowship by the German Federal Government to do a similar internship among the miners of the industrial Ruhr Valley. Another industrial commission came in 1991, when the National Trust invited him to be artist in residence at Spade's Mill, Northern Ireland. Jack Crabtree had his first solo exhibition in 1975 and since then he has had over 70 others, including at the Howard Roberts Gallery, Cardiff, the Rubicon Gallery, The Ulster Museum and the Kerline Gallery, Dublin. He has contributed to many significant group exhibitions with the Welsh Arts Council, the Trafford Gallery, the Arts Council of Great Britain and the Newport Museum and Art Gallery. Today Jack Crabtree has a secure reputation as one of the finest Welsh artists of the twentieth century. His works can be found in many private and public collections, including those of the Ulster Museum in Belfast, the Arts Council in Northern Ireland and the Arts Council in Ireland, Aberystwyth University, the National Museum of Wales, the Contemporary Art Society for Wales, the NCB, the National Library of Wales, the University of South Wales the National Trust and others. Jack Crabtree lives in Penygroes, North Wales. 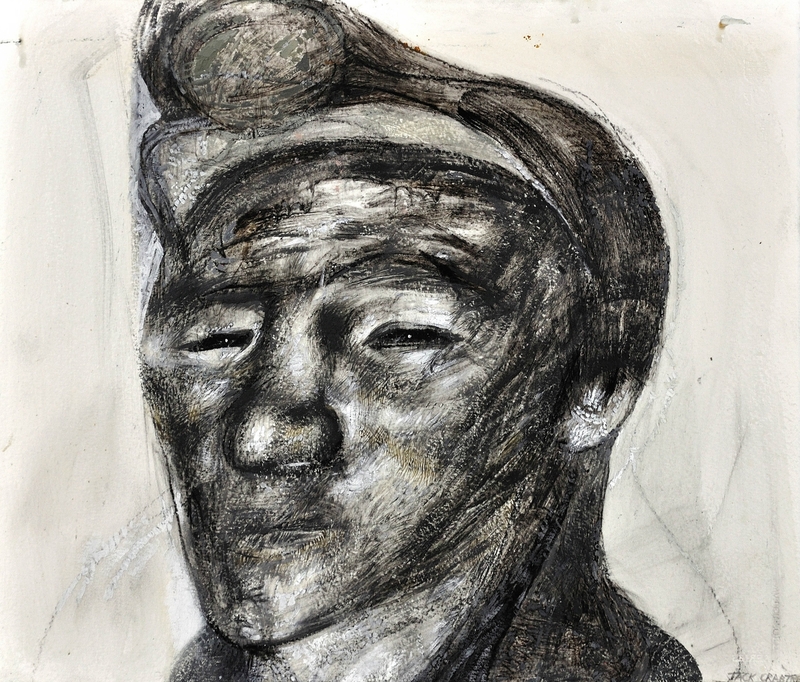 This original work is a close-up portrait of a Welsh miner. He is in working clothing, with a miner’s lamp on the top of his helmet. The piece seems to be created out of the very stuff that he mines – coal. His face and clothes are ingrained with the coal dust and his face speaks volumes about the harshness of the work he does and the bravery he demonstrates every working day. This piece is not sentimental, but real and gritty; his eyes shine out from his rugged features and you know that this is a man who says little, but moves mountains!